1.2 Types of funding organisations. 1.3 Choosing an appropriate funding body. 1.4 Contents of the grant application. 1.5 Including several studies in one application (project grants). 1.8 Estimating timelines and a planned work schedule. 1.10 Text, grammar and format. Chapter 2: People involved in the study. 2.1 Who should be part of the Study Team? 2.2 Other investigators, collaborators and consultants. 2.3 The host institution and Sponsor. Chapter 3: Justifi cation for the study. 3.2 Previous evidence and similar research (why the study is needed now). 3.4 Safety of new interventions in clinical trials. 3.6 What will the study contribute? 3.7 Summary of the justifi cation for a proposed study. Chapter 4: Describing the study design. 4.3 Study objectives and outcome measures. 4.5 Observational studies in humans. 4.6 Clinical trials in humans. 4.9 Describing the main statistical analyses. 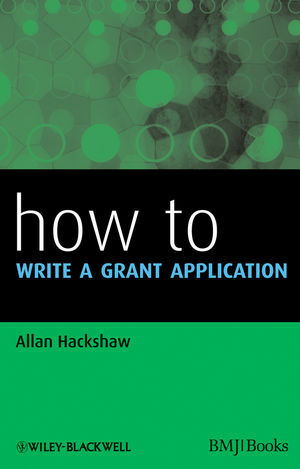 Chapter 5: Associated documents with the grant application. 5.3 Curricula vitae of the Chief Investigator and all co-applicants. 5.4 Letters of support from co-applicants, centre investigators, collaborators, or other advisors. 5.5 Letters of support from commercial companies. 5.6 Other documents specifi c to the fi eld of research. 6.1 Overview of items to include in the fi nancial costs. 6.2 Indirect costs or overheads (full economic costs). 6.3 Per patient (or per subject) payments. 6.5 Access to core funds and resources. 6.6 Consideration of costs not to be met by the funding body. 6.7 Grant applications associated with calls for proposals. 6.8 Observational studies in humans. 6.9 Clinical trials in humans. Chapter 7: Funding body review process. 7.2 Processing the application within the funding body. 7.3 Initial reviews (external reviewers). 7.6 Feedback to applicants after the meeting. 7.7 Responding to the funding committee feedback. Chapter 8: Annual reports and applying for a grant extension. 8.2 Applying for a grant extension.